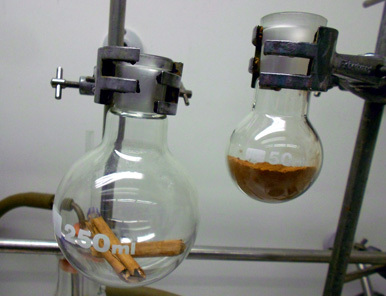 Both powdered cinnamon and cinnamon sticks shown in round-bottomed flasks, together with cinnamaldehyde, the molecule that gives cinnamon its aroma and taste. Cinnamon is most commonly recognised as a spice, used in cookery to add flavour to both sweet and savoury food. At this festive time of year, you might add a stick of cinnamon to your stewing pot of mulled wine to give it that recognisable aroma many of us associate with Christmas time. In this post we will look at the molecules found in cinnamon that are responsible for this scent and some of their other uses. 1. 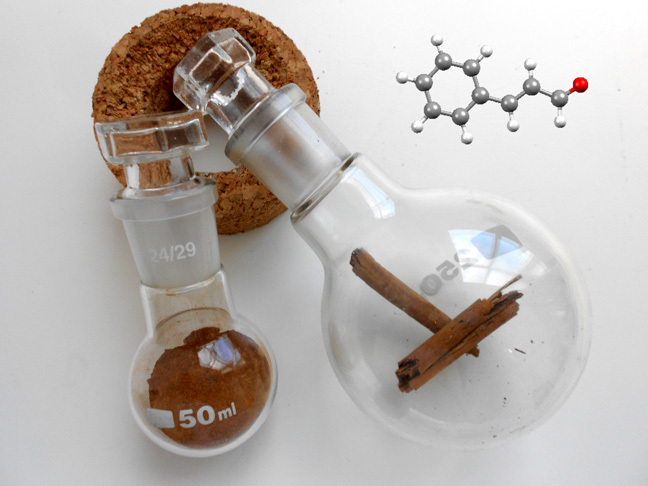 In the main image, you can see cinnamon sticks and ground cinnamon inside round-bottomed flasks, which have been stoppered and are leaning on a cork ring. Round-bottomed flasks are often used in the laboratory to heat up liquids and carry out reactions. They have ground-glass joints at the top, which make it easy to connect other glassware, for example condensers, or to stopper them securely. Their shape increases the surface area and so makes heating and stirring very efficient, but, as you can imagine, they also tend to roll away (and break if dropped! ), so need to be fixed in a clamp or rested on top of a cork ring whose shape mirrors theirs. Here they are rested on their sides to best display their solid contents; not something we would be happy (or safe) to do if they contained a hot liquid. The image also shows the molecular structure of trans-cinnamaldehyde, source of the familiar cinnamon smell. Cinnamon originates from Sri Lanka where it is found in the inner bark of several trees from the genus Cinnamomum which belong to the family Lauraceae. As the name suggests, this family also contains laurels, Laurus nobilis, the source of bay leaves used in cooking. Cinnamon trees are medium to tall trees, reaching a height of 6–15 meters in full growth. They grow well at an altitude of about 1,000 m in areas with an annual rainfall of 200–250 cm. Cinnamon is harvested between September and November; shoots with finger thickness and uniform brown colour are ideal for bark extraction. These are cut close to the ground when they are about 2 years old, as straight as possible, with a length of 1.0–1.25 m and a thickness of 1.25 cm. The inner bark is then scraped, peeled and left to dry. This is when it assumes the shape of the quill seen in cinnamon sticks (as shown in the flask on the right in the main picture above). The quills are then graded, with ‘00000’ being the finest quality, to ‘0’ as the coarsest. They can also be ground to a powder (as shown in the left hand flask) and both forms are usually exported. Cinnamon has been used as a spice throughout history, for a wide range of purposes. Its first use is thought to have been as early as 2000 BC as it was depicted in paintings found inside Egyptian pyramids. The Egyptians used the spice medicinally as they were aware of its antibacterial and antifungal properties, but also as a flavouring in beverages, and as a perfume in the embalming process, where they would fill body cavities with spiced preservatives. Cinnamon is also mentioned multiple times in the books of Exodus and Proverbs in the bible, mainly as one of the ingredients of Moses’ anointing oil, along with pure myrrh, cassia and olive oil. In the Middle Ages, cinnamon became a symbol of wealth as Europe and Africa lacked a suitable climate to enable the cultivation of the spice, so it had to be imported from the East. The cinnamon was transported by long and awkward land routes, limiting supply and making it expensive, which therefore made its use a real status symbol. 2. The flavour of cinnamon is due to an aromatic essential oil that makes up 0.5–1 % of its composition. This essential oil is prepared by pounding the cinnamon bark, macerating it in sea water and then distilling it. This leaves an oil which is golden yellow in colour and has both the odour and taste of cinnamon. The main chemical components of this essential oil are shown in Scheme 1 and include eugenol, a starting point for the synthesis of vanillin, linalool (see our post on lavender), estragole, ethyl cinnamate, caryophyllene and cinnamaldehyde (more about this later). These compounds can be separated and identified by solid-phase extraction followed by Gas Chromatography-Mass Spectrometry (GC-MS). 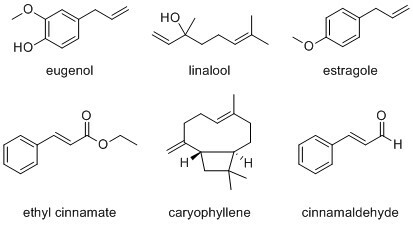 Scheme 1: Some of the compounds found in cinnamon essential oil. GC-MS is an analytical technique that links together gas chromatography and mass spectrometry. Gas chromatography separates a mixture of compounds; it starts after dissolving a sample into a solvent and injecting it into a column. An unreactive gas then carries the sample through the column, where the different compounds travel at different speeds, depending on how well they bind to the coating of the column, called the stationary phase; they therefore elute at different times. This approach is similar to paper chromatography familiar to most people, where, in its simplest form, the colours of felt tip pens become separated, and so apparent, when water slowly soaks through some marked filter paper. The compounds eluting from the gas chromatograph are then turned into ions and a mass spectrometer is used to identify each of these substances. Each ion can be identified from its weight, locating the molecular ion peak in the spectrum, but also from the smaller and lighter compounds it breaks into during the procedure. For more details about GC-MS, have a look at this page produced by one of our Bristol colleagues. 3. 90 % of cinnamon essential oil is made up of an organic compound called trans-cinnamaldehyde or 3-phenylprop-2-enal (shown in the main image and in Scheme 1). It was a past Molecule of the Month selected by our Bristol colleagues and is responsible for the distinctive smell and taste of cinnamon. There are several known methods of chemical synthesis, although Wikipedia suggests that it remains cheapest to extract cinnamaldehyde by steam distillation of the oil of cinnamon bark. In the laboratory, it can be prepared from related compounds such as cinnamyl alcohol (Scheme 2), but also from structurally unrelated compounds, for example by aldol condensation of benzaldehyde and acetone. The kinetics and mechanism of this, and related reactions, were explored in detail by Guthrie and Wang in 1991 (Can. J. Chem. 1991, 69, 339-344). This synthetic route initially uses strong base to generate the acetone enolate ion (shown below, Scheme 3). Scheme 3: Mechanism for the formation of the enolate ion. This enolate is very nucleophilic, allowing it to attack the carbonyl in the benzaldehyde (Scheme 4). This then forms an alkoxide ion which can take a proton from water to form a beta-hydroxy ketone. The electron pair on the carbon is then used to eliminate the hydroxide ion, forming an alpha,beta-unsaturated ketone, the desired product, trans-cinnamaldehyde. This compound is also the starting material for the synthesis of more complex molecules and a range of routes for its preparation continue to be described (J. Org. Chem. 2011, 76, 8986-8998). 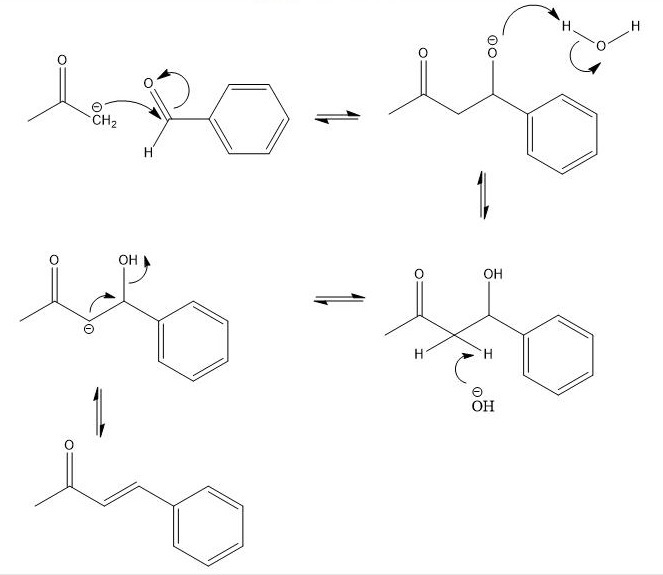 Scheme 4: Reaction mechanism for the formation of cinnamaldehyde from benzaldehyde and acetone. The most familiar application of cinnamaldehyde is as a flavouring in food and beverages, but it also has anti-microbial properties, of interest to a range of industries (see, for example, Int. J. Food Microbiol. 2004, 94, 223–253, Progr. Org. Coatings 2007, 60, 33–38, Environ. Chem. Lett. 2012, 10,325–347), where it can be used to inhibit the growth of various microbes (Nutrients 2015, 7, 7729-7748) such as bacteria, fungi, moulds and dermatophytes. This ability, along with its low toxicity, also make cinnamaldehyde a useful fungicide which has been proven effective on over 40 different crops. GC-MS has been used to determine the cinnamaldehyde content of different foods, with a view to determining whether its antimicrobial properties are retained during processing (J. Agric. Food Chem. 2000, 48, 5702−5700). Cinnamaldehyde may also have beneficial effects in the treatment of diabetes, although further study appears to be needed in this area (Diabetic Medicine 2012, 29, 1480-1492). (Contributors: Olivia Levy (research, writing, photos, images), Natalie Fey (editing). Categories: Cookery, Food, Fragrance, fungus, Organic, Plants, Scent, Winter | Tags: Bristol, chemistry, Christmas, cinnamaldehyde, cinnamon, extraction, food, medicine, scent, science, spices, synthesis | Permalink.